Earn points for prizes, have lots of fun. Monday, August 20th: Meet and Greet. Bio, blurb, cover, & 3 random questions. Wednesday, August 22nd: Excerpt One from Demons of the Sun posted (Challenge Members get to see a different excerpt exclusively until the day before release). Tuesday, August 4th: Celebrate release day and Announce Winners! - Greek Mythology, crazy chemistry, non-stop action. Demons of the Sun by @CindiMadsen is a must read! 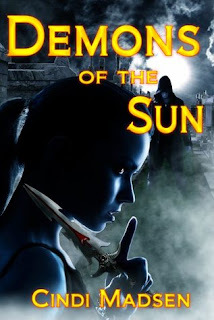 The FIRST to 500 points on or before 11:59 pm 9/3/12 wins the Grand Prize: A signed bookmark, A copy of Demons of the Sun, and a $15 Amazon Gift Card! If you are interested in joining the flirtsquad email Rachel at flirtsquad@gmail.com and let Rachel know that Ali @ Little Paint Chips referred you and let her know that you want to participate in the Demons of the Sun by Cindi Madsen contest.